Under contract to the FAA, HMMH led a research team to develop and validate a research protocol for a large-scale study of aircraft noise exposure-annoyance response relationships across the U.S., and to propose alternative research methods for field studies assessing the relationship between aircraft noise and sleep disturbance for U.S. airports. The first phase of this Study included the collection of data for the purpose of testing an aircraft noise annoyance survey in order to update the dose-response relationship between noise exposure and the percentage of people who are highly annoyed. The second phase, the sleep disturbance portion of the ACRP Study, included: developing at least two general research protocols to improve the understanding of the relationship between aircraft noise and sleep disturbance in a field setting, and identifying criteria to be used to test and evaluate the protocols. 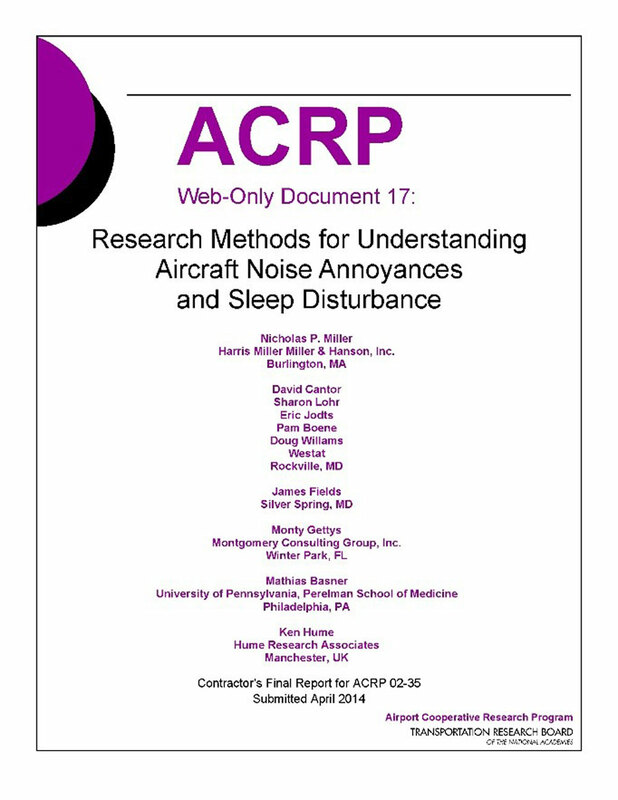 Published in April 2014, ACRP Web-Only Document 17: Research Methods for Understanding Aircraft Noise Annoyance and Sleep Disturbance describes the annoyance survey methodology that was developed and applied, and the results relevant to the goals of the Study. It also discusses airport-community relations, presents the final sleep disturbance study designs and provides budget estimates for each type of study. This project validated the approach that is currently in use in an FAA National Annoyance Survey of 20 Airports. HMMH worked with the FAA to refine the survey methods based on the results of the ACRP research. This allowed the development of an appropriate statistical process for randomly selecting the 20 representative airports, and identification of other factors and metrics that might provide predictive value to community annoyance and aircraft sound levels.